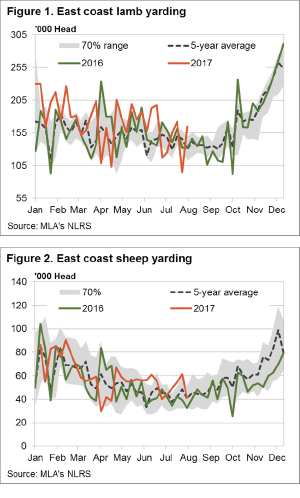 Some big moves again in East coast lamb and sheep yardings this week, heavily influenced by NSW flows, but for the most part prices around the country finished firmer. The headline, Eastern States Trade Lamb Indicator rising 1.3% to break back above 600¢ – although stronger gains were noted across other categories of lamb across the country. Figure 1 highlights the sharp rebound in lamb throughput at East coast saleyards this week, with a gain of 74% to see just shy of 165,000 head of lamb exchanged. The rebound driven by a surge in lamb throughput in NSW which posted a whopping 108% increase in numbers on the week. It is reasonable to argue that the size of the NSW gain is a bit distorted as the previous week’s numbers were much lower than normal, however the 138,000 head of NSW lamb throughput this week is still 37% above the five-year average for this time of the year. A similar, but opposite story for sheep yardings along the Eastern seaboard. Figure 2 demonstrates the 33% decline in sheep throughput on the week to see 41,000 head at the sale yard, to see it pretty much in line with longer term average levels. NSW again the driving force behind the lower sheep numbers with a 67% decline noted here this week, although the 33,000-odd head reported still 30% above the five-year average in NSW for this time of the season. The volatile supply figures did little to dampen most lamb and sheep prices though, with national categories showing Restocker Lambs the only category to post a decline on the week – down 5.3% to $75 per head, dragged down by an 18% drop in WA Restockers. 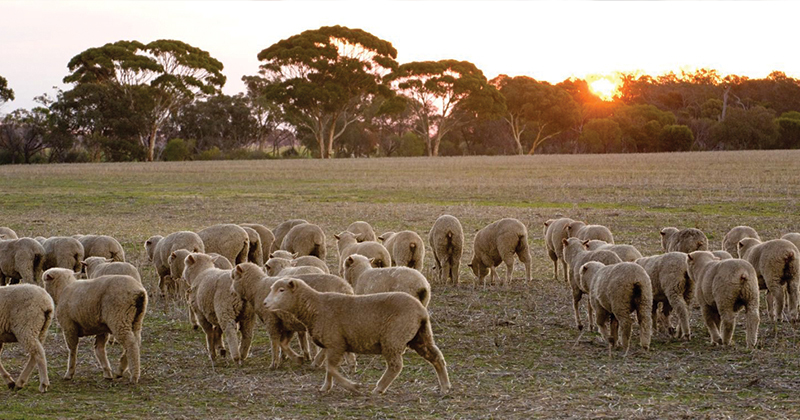 National Merino’s, this week’s winner with an 8.5% rise to 564¢/kg cwt – boosted by strong gains to Merino Lambs in Victoria and SA, up 20% and 16%, respectively. National mutton stronger this week too, up 5.4% to 431¢/kg cwt, as a rebound in Victorian and NSW mutton prices assist the national indicator. A softer $A, now below 79US¢, flowing through to higher export demand a good sign for the weeks ahead as live export wether prices post a 10.8% gain on the week to close at $140 per head. In other weather news, forecast rainfall for the week ahead shows some good falls to lamb rearing regions of the nation, with NSW the only state to miss out on falls above 5mm. Despite the dry patches in NSW the rainfall to the rest of the country should continue to be broadly supportive of prices in the short term.